Jakarta Communication Informatics and Statistics Dept. 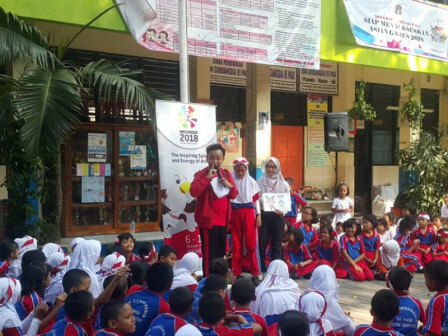 (Diskominfotik) socializes Asian Games 2018 events to students of SDN Gondangdia 03 and 05 Pagi, Jalan Probolinggo, Cikini, Menteng, Central Jakarta.
" We encourage schools to support Asian Games event"
Socialization is done through games and entertainments. "We encourage schools to support Asian Games event by spreading Energy of Asia," stated Ika Meilani Untari, Head Section of Jakarta Diskominfotik's Public Communications Resources and Information Access, Friday (7/27). According to her, Asian Games socialization for elementary students is on target. Because it can stimulate those students to have a goal in becoming athletes in the future. SDN Gondangdia 03 Pag Headmaster, Rahmat expresses his gratitude because that school is chosen for socialization. At least 260 students participate in this socialization. "Students are quite enthusiastic and we also remind them to watch Asia n Games. At least to watch it from TV," he added.